Josh Perkins is lighting it up from outside so far this season — even if some announcers don't realize it. With a loss to Villanova, a win over Washington and some disrespectful pronunciation on television, last week was a blast from the Gonzaga basketball past. It took until literally the final game of the 2016-2017 season for the Zags to reach two losses. This year it’s taken just a month. But both of the Zags’ losses this year have come to teams ranked in the top 10 of the Associated Press poll. Florida was No. 7 at the time and Villanova was No. 4. Not exactly something to hang your head about. In all, the Zags have played three AP Top 25 teams so far this season, No. 25 Creighton being the other. During the non-conference portion of last season the Zags faced just two. It’s reminiscent of the early years of Gonzaga’s run of basketball excellence, the days when Gonzaga would travel seemingly anywhere just to get a shot at the big boys of the sport. The Florida game was in Portland and the Villanova game took place inside New York’s hallowed Madison Square Garden. And while UW isn’t ranked, Gonzaga just spent the weekend in Seattle to face the Huskies. Over a decade ago, when Gonzaga was still an up-and-coming program, the Zags and Huskies played annually. It was the kind of series that college sports fans love — an in-state rivalry between schools from the two biggest cities in the state. A real big brother, little brother dynamic. But after the 2006-2007 season the in-state rivalry was put on what seemed like a permanent hold, in large part because Gonzaga, the little brother, had made a habit of whooping the Huskies. The Zags won five of the final six games against Washington. Thankfully for Washingtonians on both sides of the Cascades the series is back on. The Huskies visited the Kennel last season, and lost, and Gonzaga went to UW’s campus this season. And, as is almost always the case, the Zags claimed Washington as their own. Six Bulldogs scored in double-figures in Sunday’s 97-70 rout, led by Johnathan Williams’ 23-point performance. It was a big bounce-back for the senior forward after a rough outing against Villanova. In many ways this was the polar opposite of the Villanova game. Gonzaga never trailed against Washington, and the only time the teams were tied was when the score read 0-0 at the start of the game. The Zags’ guards looked calm and poised. Against Villanova the Zags committed 19 turnovers. 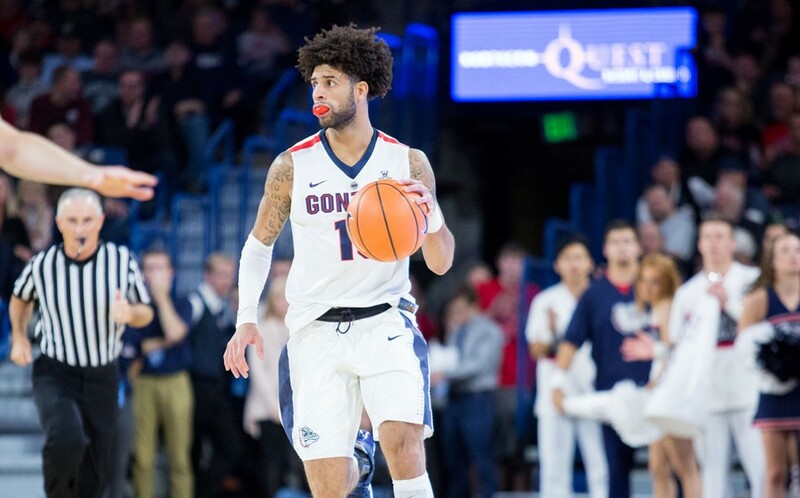 Against Washington the Zags coughed the ball up just eight times. The Huskies did so on 12 occasions, which led to a number of highlight-reel transition dunks for the Zags. It was a home game for the Huskies, and a sellout at that. But as was evident each time Gonzaga made a shot, much of the crowd was wearing Bulldog blue rather than purple and gold. While the roar of the Gonzaga faithful was audible over the television broadcast, it wasn’t loud enough to drown out some disrespectful color commentary from Pac-12 Network analyst Don MacLean. To his credit, MacLean didn’t make that mistake again. But he did repeatedly show a stunning lack of awareness of the Gonzaga team he was being paid to talk about. "Washington will live with that shot,” MacLean said after Josh Perkins drained a three. “How many of them are you going to make if you're Josh Perkins?" The answer is a lot. Perkins came into the game having made 30 of 60 three point shots this season, the 19th most in the NCAA. You don’t have to watch Gonzaga to know that. You barely have to research the team at all to know that. It was listed literally on the front page of the pregame notes Gonzaga prepares for media members. This will never end. “Gun-zah-guh” will never go away. Despite all that Gonzaga has accomplished as a program, people who should know better still know so little about the Zags. It’s annoying, and it’s irritating, but it’s not all bad. These are the little things that motivated this program and this fanbase over a decade ago. Why stop now?